-Computer Link: Un ability to link into computers and other electronic devices. 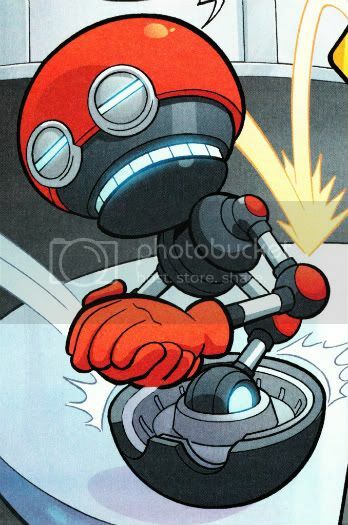 Orbot was stored aboard the Death Egg Mark 2 until Eggman activated him and Cubot when Snively made his move against their creator. Once they hacked into the Eggnet, Orbot discovered Snively was responsible for locking them out, which included a message to the entire Dark Egg Legion telling the Eggman Empire had fallen. Despite Orbot and Cubot's concerns over running on reserve power, he complied with Eggman's orders and beamed in the Grandmasters for an emergency meeting. Once they were assembled there, Orbot and Cubot served refreshments, much to Eggman's chagrin. With the meeting over, Orbot joined Cubot, Eggman and Mecha Sally aboard the Egg 'Stache Flyer and began their hunt for Snively while Orbot pointed out the tracker on Snively's Egg Jet had strangely not been disabled.